Arrangements should be made at least 6 months prior to the intended wedding date. Couples should call one of the parish priests as soon as possible to schedule an appointment and to begin the arrangements. 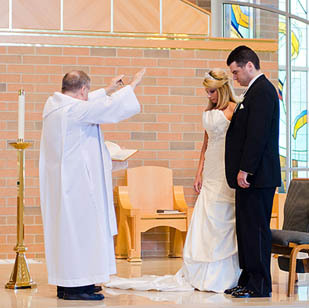 Couples can learn more about the sacrament of marriage and the many teachings of the Catholic Church on related topics. You will find the For Your Marriage website to be a good resource for information on living the sacrament of marriage and much more. You can download your wedding preparation documents here! A Pre-Cana engaged couples day retreat is needed prior to the wedding date, which can be taken at St. John Vianney or another local parish.